Description: Commemorating the U.S. Navy beach jumpers of World War II, this monument is a large marker of polished granite with engraved inscriptions and color images of insignia. One side bears the image of the amphibious unit training base, the Loop Shack Hill, and the other bears the image of a patrol ship and Douglas Fairbanks, Jr., the Hollywood actor who joined the service as a lieutenant in World War II. The inscription on the east face includes the motto of the Beach Jumpers, the Latin phrase Turbo Vestri Hostilis. Translated literally as, "a storm to your enemy," the phrase signifies the tactical skills and art of the beach jumpers in deceiving the enemy. West face: U.S. NAVY BEACH JUMPERS / LOOP SHACK HILL / ADVANCED AMPHIBIOUS TRAINING BASE, OCRACOKE (AATB) / DECEMBER 1943 TO JANUARY 1946 / IN DECEMBER 1943, THE U.S. NAVY SECTION BASE BECAME THE ADVANCED AMPHIBIOUS TRAINING BASE / (AATB), FOR THE BEACH JUMPERS. EXPERIENCED OFFICERS AND MEN FROM THE EARLIER UNITS WERE / BROUGHT BACK TO ASSIST IN THE TRAINING OF UNITS 6, 7, AND 8 PERSONNEL, WHO WOULD LATER / SERVE IN THE PACIFIC. THESE UNITS WERE TRAINED IN BOTH CLASSROOM AND LIVE EXERCISES, OF / SEABORNE DECEPTION. TO SIMULATE FULL FORCES INVASIONS ALONG THE BEACH WHILE ON BOARD, OF / 63 FT. ARBS (AIR-SEA RESCUE BOATS). THE BOATS WERE CAPABLE OF HIGH SPEEDS AND CARRIED TIME / DELAYED EXPLOSIVES, AMPLIFIERS, RECORDERS (SOUND EFFECTS), SMOKE POTS, RADAR, RADIOS, / ROCKET LAUNCHERS AND TWO SETS OF TWIN 50 CALIBER MACHINE GUNS. THEY ALSO USED RADIO AND / RADIO COUNTER MEASURES TO DECEIVE THE ENEMY, IN MAKING THEM BELIEVE AN INVASION WAS / TAKING PLACE ALONG THE BEACH. THE BASE WAS CLOSED IN EARLY 1946. AFTER WORLD WAR II ENDED / AND THE BOATS WERE RETURNED TO LITTLE CREEK, NAVY AMPHIBIOUS BASE, VA.
East face: U.S. NAVY BEACH JUMPERS / "TURBO VESTRI HOSTIBUS" / MARCH 1943-1972 / LT. DOUGLAS FAIRBANKS, JR. / BEACH JUMPERS WERE UNITED STATES NAVY TACTICAL COVER AND DECEPTION UNITS WHICH / WERE ORGANIZED UNDER VICE ADMIRAL H. K. HEWITT, THEN COMMAND, AMPHIBIOUS FORCES U.S. / ATLANTIC FLEET, AND ALL U.S. NAVAL FORCES IN NORTHWEST AFRICAN WATERS AND WESTERN / MEDITERRANEAN. THE CONCEPT FOR BEACH JUMPERS CAME ABOUT AS A RESULT OF THEN LIEUTENANT / DOUGLAS E. FAIRBANKS, JR., THE HOLLYWOOD ACTOR TURNED NAVAL OFFICER DURING WORLD WAR II, / HAVING BEEN DETACHED FROM "BLUE WATER" DUTY ON THE HIGH SEAS AND ASSIGNED TO DUTY WITH / BRITISH ADMIRAL LORD LOUIS MOUNTBATTEN, COMBINED OPERATIONS (COMMANDOS) IN ENGLAND. Unveiling & Dedication: A number of veterans of the Beach Jumpers were on hand for the dedication event which began at the Ocracoke Preservation Society Museum and included presentations by the Ocracoke Preservation Society and the National Park Service. Attendees traveled to the Loop Shack Hill site on Highway 12 for the unveiling. The event also included a three-day reunion of Beach Jumper veterans. monitored hidden German submarine activity off the eastern coast of the United States during the war. The project included both the training facility and monitoring station on Loop Shack Hill. Douglas Fairbanks, Jr., the Hollywood Actor, interrupted his film career in World War II to enter the Navy. He was on special assignment with the British Navy under Admiral Lord Mountbatten. Their operations involved deception of the enemy in part by staging false invasions. 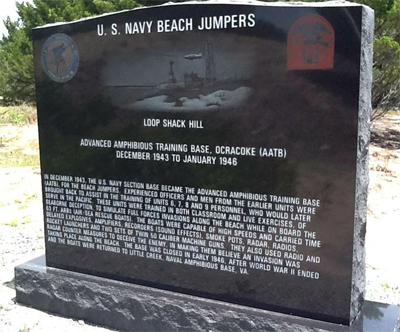 When he returned to the U.S., Fairbanks brought the idea for development of similar operations in the U.S. military, resulting in the development of the program at Loop Shack Hill on Ocracoke. Location: The marker is on Irvin Garrish Highway (North Carolina Route 12) east of Ocracoke Village. Landscape: The marker sits in the sand and grass next to the highway.